Though there are dissenting opinions, the global scientific community is optimistic that the damage to many of the world’s largest reef systems can be reversed. That is, if human behaviour changes to prevent the damage from being repeated, writes Noelle Neff. This year it is the International Year of the Reef. Worldwide, programmes are being rolled out to raise awareness of these marine habitats and the need to conserve them. It's no secret that, here in Australia, we have been causing a great deal of damage to our Great Barrier Reef. For instance, tour operators are now pledging to stamp out the use of the latest threat to the environment — plastic straws. But things have gone from bad to worse, recently, for this iconic natural wonder of the world. In addition to the major bleaching events of years past, the Reef is now facing a new challenge — a coral-eating starfish called the Crown of Thorns. These nasty, poison-tipped starfish have established themselves all along the Reef and are feasting on what remains of a once vibrant underwater Garden of Eden. 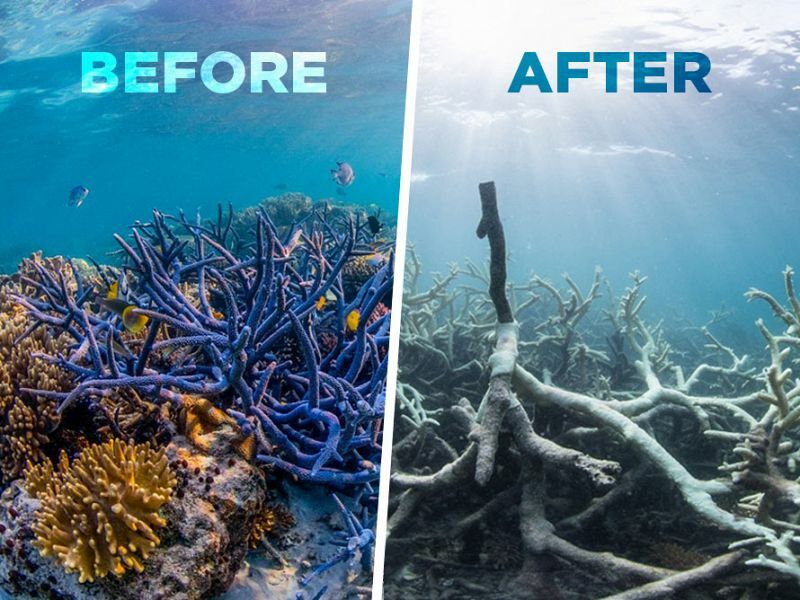 While this may seem like nature’s way of finishing off a dying ecosystem, it is important to remember that The Great Barrier Reef is crucial for the Australian economy. Generating over $4 billion annually, the region can be still be saved. To this end, the Australian Federal Government has pledged $60 million in funding to help stem the destructive tide of pollution and natural predators plaguing our waters. Coral reefs are vital. They house 25 per cent of all marine life, protect our shores, and provide food for communities that subsist on fishing. Yet they’re dying off at an alarming rate due to pollution, global temperature changes, and shifts in the pH levels of the ocean. Most scientists are alarmed. Some, however, are optimistic. Prof Eugene Rosenberg, a coral microbiologist at Tel Aviv University, Israel, is now happy to be a voice of opposition against those who tout that there will no longer be any reefs in another 50 years. Why? The vast swathes of reef around the Florida Keys, for example, have been infected by a disease known as the White Plague which was proven to be caused by bacteria. And this is good news, because with the culprit known, natural viruses in the sea were able to be found that would destroy the bacteria, thus halting the spread of the disease and reducing the impact it has on already-affected corals. But does this have an impact on the largest and most well-known of reefs? The Great Barrier Reef is white, not simply because of a disease, but because it’s been bleached — a process that happens when the water is acidic enough that the coral expels all the algae living inside of it. Bleaching is bad for many reasons, including it inhibiting coral growth and also by making reefs more susceptible to diseases. If the ocean grows even more acidic, the coral will start to dissolve, meaning the damage will be irreparable. This is not the only difficulty faced by reefs. The process of reproduction has also become more difficult as humans cause more damage to the ocean. While reefs spawn both sexually and asexually, both processes are interrupted by human movement. Sexual reef reproduction usually only happens once a year — eggs and sperm both float to the surface of the ocean, and fertilised eggs drift back down to the ocean floor to take root and grow. With increased boat and fishing traffic, however, this would be impossible, unless, of course, scientists once again intervened. By stepping in, scientists can cross-breed various kinds of coral reefs. In doing this, they increase genetic diversity and make the coral less prone to disease. The cross-bred coral is grown to a more mature age in coral nurseries, before being set out to live amongst other corals. The same process can happen asexually, with branches that fall off healthy coral. These are being regrown in the hopes that they can be transplanted to new environments and other sections of dying coral. Alongside this, researchers in the Great Barrier Reef have found signs of life in the swathes of dead coral. They’re super corals, able to withstand excessive amounts of heat stress and they’re under intense study to see if the best of their genes can be reproduced, grown, and put back into the wild to create a hardier, longer-living coral. Other super corals which have withstood massive pollutant dumps in Hawaii and Australia (see our reports on the Adani Carmichael Mine) are being similarly studied and regrown. Along the coast of Florida, rapid replacement techniques due to heat death are helping bolster the reefs there. Genetic storage banks are being gathered in the Caribbean as back-ups in case what little reef we have yet, dies. However, scientists still face major difficulties despite these progressions in technology and research. In the end, a lot of the issues come down to funding — scientists simply don’t have the means of implementing these advances on a large enough scale to see if they’ll halt the looming tide of destruction. Not only that, the most effective method of genetics is also the most expensive. With tourism industries taking such a large hit in affected areas, scientists would hope to expect more of a budget to work with, in the hopes of expediting the return of reefs but, instead, they struggle to continue with the research they’ve already started. And, as our climate continues to warm, many scientists wonder if the effort is worth it. How much human intervention is worth it? Should we continue to sustain coral reefs, is it right to do to the wild what we’ve done to crops? Is it worth it, if other steps aren’t taken to ensure that the Earth does not continue to heat up? We’re pioneering a world of science and ethics that hasn’t been explored yet, and it will be years before conclusions are found. But with funding, trust, and a lot of hard work, we may not have to say goodbye to our coral reefs quite yet. Subscribe to IA for articles deeper than a coral reef.